Perez, M.V. 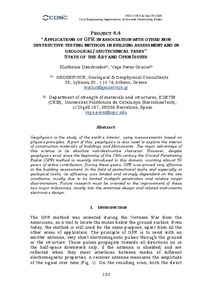 ; Dimitriadis, K. Project 4.4: application of GPR in association with other non-destructive testing methods in buildings and assessment and in geological/geotechnical tasks. State of the art and open issues. A: Civil Engineering Applications of Ground Penetrating Radar. "COST ACTION TU1208. Civil Engineering Applications of Ground Penetrating Radar. Proceedings. First Action General Meeting". Roma: 2013, p. 183-190.